When Lord Wolfenden saw, in the supper-room of the Milan Restaurant, a beautiful woman and became acquainted with her by saving the life of her elderly companion, the mysterious Mr. Sabin, as they leave the restaurant, he little knew the web of intrigue into which he was entering. Twists and turns galore, enjoyable descriptions about the upper-crust and by-gone days. Mr. Oppenheim can be depended upon to give his plots that turn which is as admirable as it is unexpected, and this is one of the best of his many good and exciting books. 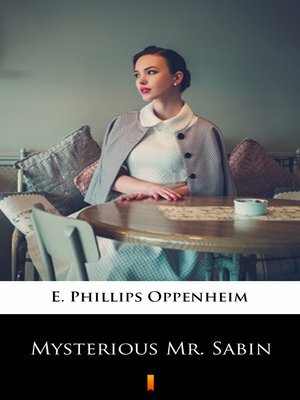 It was largely the success of his first spy novel, „Mysterious Mr. Sabin", that enabled Oppenheim to relinquish control over the family business and devote himself to a full-time writing career.